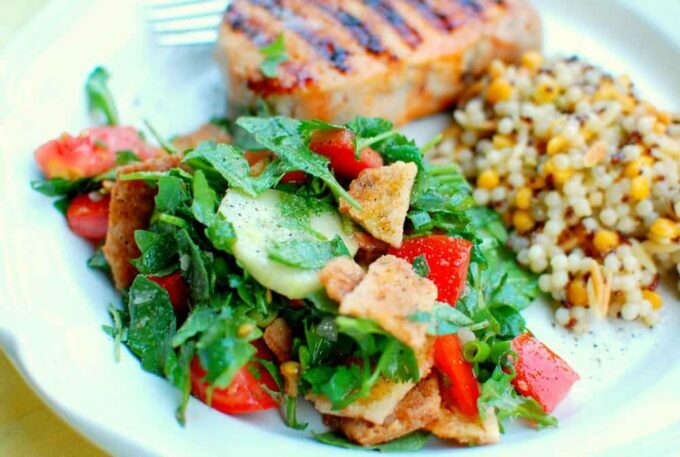 Who doesn’t like a nice fresh salad, especially when it contains arugula and cilantro. 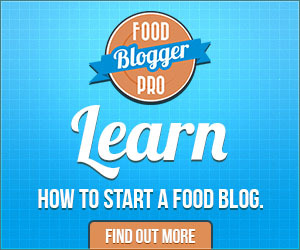 Combine that with fresh chopped tomatoes, cucumber and green onions. THEN, add some crispy toasted pita bread chunks and a simple dressing and you’ve got a great tasting toasted pita bread salad! 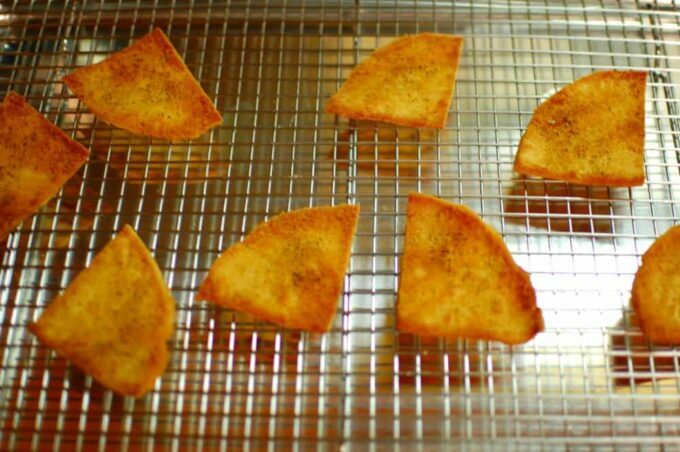 The toasting method of the pita bread is the key to making a crispy piece of bread that doesn’t turn all soggy once the dressing is applied. 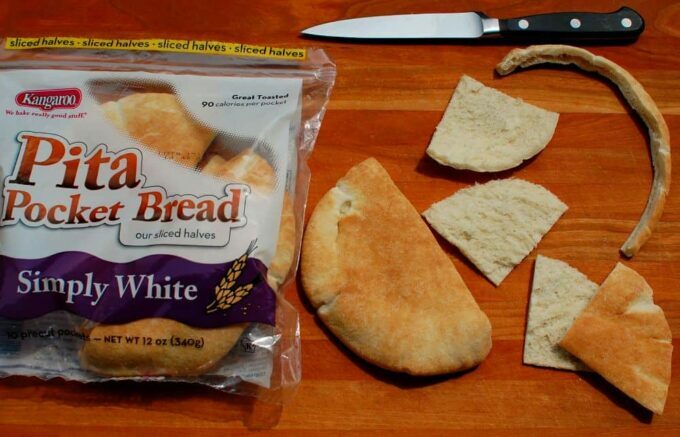 First of all, make sure that you buy pita “pocket” bread. Your’s truly bought what I thought was pocket bread, but it turned out to be pita bread, no pocket! I went back to the store and searched for about 10 minutes for pocket bread with no luck. I finally asked an employee where I might find pocket bread and she really didn’t have a clue. Maybe in the bread aisle or it could be in the aisle with ethnic foods or it could be next to the deli. This nice girl was in the express check out, and it wasn’t very busy, so she closed down her lane and lead me around the store in a search. Finally! It was in the deli section and they had one choice. Real pocket bread that came cut into semi circles and it really had a pocket. Start making the toasted pita bread by trimming the circular edge off the pita. I used a sharp knife to do this. Cut the bread in half and separate. I toasted three circles for my salad. On a piece of waxed paper. 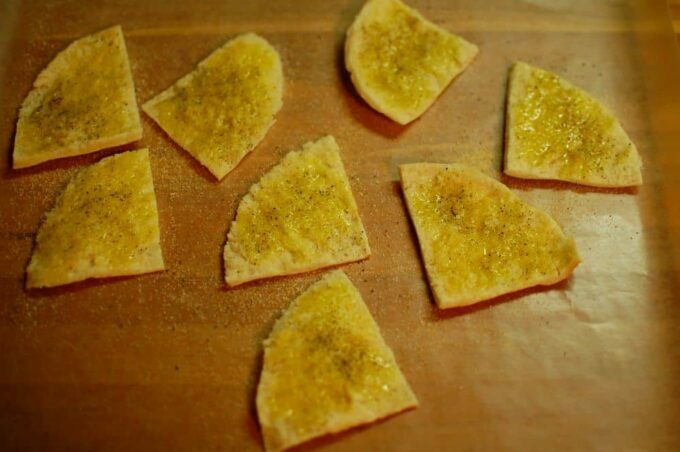 brush the inside of the pita with olive oil, then sprinkle with salt and pepper. Add garlic powder too, if you’d like a garlic flavored bread. Place on a rack that is inserted in a baking pan. Finished toasted pita bread. These were baked at 375° for 11 minutes. I turned the pan a couple times to insure even browning. 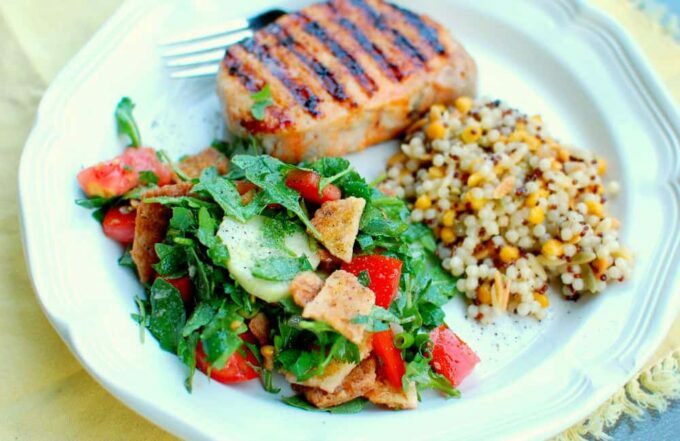 This yummy salad was a perfect compliment to grilled pork tenderloin with my sriracha glaze. 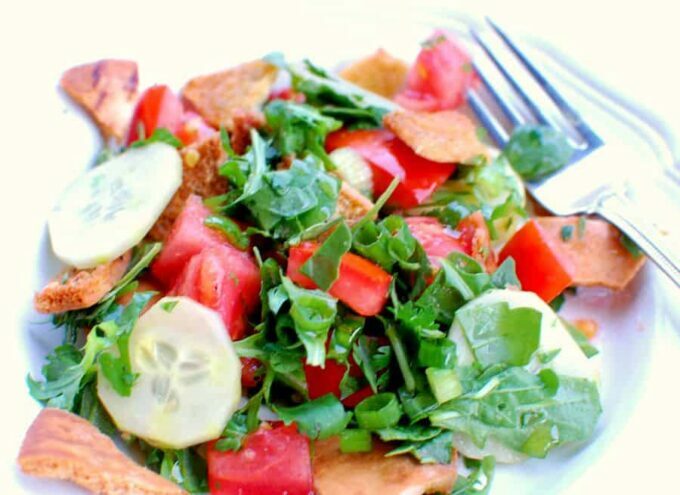 Make yourself some toasted pita bread salad! 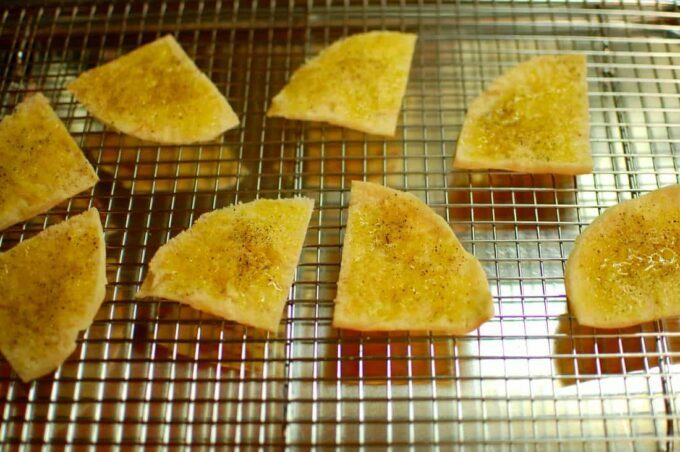 Brush the inside of the bread with olive oil then add salt and pepper and garlic powder if desired. 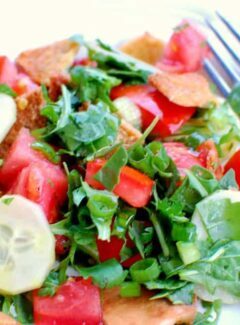 Mix the arugula, cilantro, tomato, cucumber and green onion in a large bowl and combine.